BUCYRUS — Bucyrus Hospital’s Emergency Department was recently presented the “Golden Hour Award” for Excellence in Trauma Care by Grant Medical Center. The award was presented by Dr. Shay O’Mara, Chief of Trauma and Acute Care Surgery at Ohio Health and Stacey Wickham, RN to Avita representatives: Katie Spellman, RN, Ashley Scherger, RN, and Marie McKenna, RN, on October 18 at the 2017 Trauma Conference at the Hilton at Easton. Bucyrus Hospital received the “Golden Hour Award” for the outstanding service and stabilization of a patient who experienced trauma due to a serious fall in April 2017. In the health industry, the “golden hour” refers to the sixty minutes following an accident or injury in which the chances of survival are most likely if treated appropriately by healthcare professionals. Courtesy photo Bucyrus Hospital’s Emergency Department was recently presented the “Golden Hour Award” for Excellence in Trauma Care by Grant Medical Center. 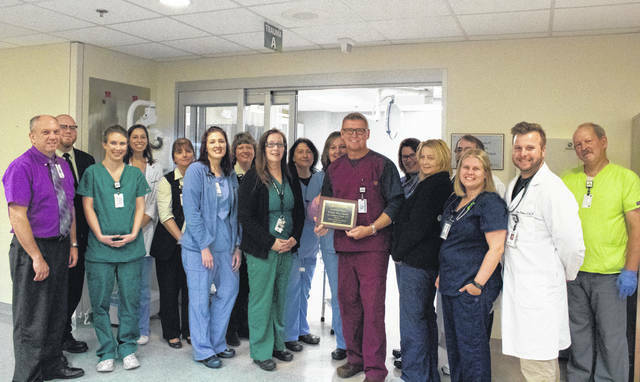 https://www.galioninquirer.com/wp-content/uploads/sites/38/2017/11/web1_TeamPhoto-2163_Edited.jpgCourtesy photo Bucyrus Hospital’s Emergency Department was recently presented the “Golden Hour Award” for Excellence in Trauma Care by Grant Medical Center.